I will warn you, no matter the movie, if there are plants or scenes with plants, I will be intently checking those out and may forget what else the movie is actually about. I do love a good movie that features either gardeners or plants. I won't bother to list them all here. You can use any search engine and type in terms like "movies about plants" or "movies with gardeners" and come up with a lovely, curated list that will get you started. Whoever publishes those lists will also likely have taken the time to source a picture for each movie listed. I won't be doing that. I have no time for that. Dee and I talked about movies with plants in this week's podcast episode of The Gardenangelists. I will provide a link to it... here it is. 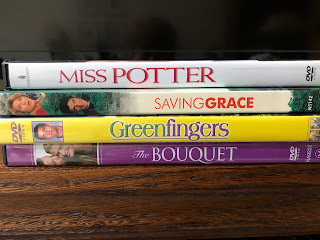 We chose the movie theme because February is "Oscar Month" and because we've mentioned on several other podcast episodes how much we both like movies featuring plants and gardeners. Dee talked quite a bit about a movie, Mrs. Miniver, from 1942. I hadn't heard of it, or if I had, I didn't remember it. Now I'm going to find it and watch it but I must warn you, it might send me down a bit of rabbit hole. And it might be a rather deep bit of a rabbit hole involving roses, lost rose varieties, rural England, and World War II. This rabbit hole could have a lot of tunnels and rooms to explore, once I get sucked down into it. I could be a while. Of course, I'll share any treasures I come up with down in that rabbit hole. In the meantime, closely related to movies are documentaries. I just watched one about the famous landscape architect Jens Jensen, "Jens Jensen: The Living Green" and then I bought a book to read more about him, Jens Jensen: Maker of Natural Parks and Gardens by Robert E. Grese. (Affiliate links, the both of them). A member of my garden club told me about these. We are researching the history of the club and apparently, one of our founding members had a garden designed by Jensen. Yes, Jens Jensen is another rabbit hole with a rather slippery slope. So, if you are looking for me, I'm going to be either down a Jens Jensen rabbit hole or watching the movie Mrs. Miniver, preparing for whatever journey that takes me on. Rest assured, or be afraid ... I'll take my computer with me so I can tell you all about it. I will look forward to rabbit hole reports. The British TV show "Rosemary and Thyme" combined two of my favorite things - murder mysteries and gardening. It was maybe on PBS at one time, and I think it is available on DVD now. Jen Jensen did the landscaping for the Allison Mansion at Marian University. I have seen photos of the original work. They are very innovative and beautiful. I loved "Rosemary and Thyme" on PBS. The Movie Bernard and Doris has some amazing orchids. Doris Duke was a founding member of the American Orchid Society and Duke University has the Sarah Duke Gardens.